Adolf Hitler was adamantly opposed to Communism and was supported in this by Britain and the USA, right up until he threw out the bankers. At that point Churchill was manoeuvred into power by the bankers to bring Germany back under their control. No matter that a world war followed that left millions dead or that the Soviet Union was left in control of most of Eastern Europe. As far as the bankers were concerned Churchill had fulfilled his task. For far from being a great leader, he was simply a servant of the money powers who had helped them reassert control over Europe. Sir Anthony had a better grasp of this than Churchill. In fact Sir Anthony was to say Churchill had a poor grasp of politics and international intrigue, and would concentrate on relatively minor matters to the exclusion of the bigger picture. On his own initiative, Sir Anthony presented Churchill with the most important papers and ideas leaving Churchill’s subordinates to deal with less important affairs. Without Sir Anthony’s scrutiny and prioritization, Churchill could have been easily have been sidetracked and bogged down in less important tasks. Nonetheless, Churchill still made key decisions, for better or for worse. During WWII one such was the Allied bombing campaign of German civilians and despite what the history books may say, this was not Bomber Harris’s brainchild. Sir Anthony claimed that Lord Cherwell had more influence on Churchill than almost anyone else and it was Cherwell together with Churchill who had masterminded taking the war to the wives and children of German soldiers. In this too Churchill was fulfilling the bankers wishes. For the money-powers wanted the German factories intact to later seize as war reparations. So civilians had been targeted instead in an effort to undermine Germany’s war morale. Moreover, according to Sir Anthony Churchill had also implicitly sanctioned General Eisenhower’s campaign of genocide against German Prisoners of War, in which more than a million and some estimate as many as 9 million German POWs died. Churchill’s quote, “A prisoner of war is a man who tries to kill you and fails, and then asks you not to kill him.” was cited by Lawrence Burgis as proof that Churchill knew what Eisenhower planned to do at the war’s end. Nor should we forget that Churchill was loathe to feed and house hundreds of thousands of German prisoners and refugees. For Churchill it was easier and more cost effective to bomb and burn them in their homes, or order the RAF to strafe refugee columns, as they did. This alone has prevented the wartime bomber crews ever getting any medals. Lord Cherwell was said to spend more time with Churchill than even Rothschild or Churchill’s wife and Lord Moran, Churchill’s doctor often wondered if she really knew real Churchill’s sexual tastes. Quite possibly she didn’t as Jock Colvile was known to bring him prostitutes. While Sir Anthony was to admit Churchill liked to visit Morocco the homosexual hide away of the time where young boys were easily available. As with so many of history’s victors, the less savoury aspects of Churchill’s past have been airbrushed out of the official record. After Churchill’s resignation in 1955 Sir Anthony was suddenly brought back from the Foreign Office to be Churchill’s private secretary to discuss the blossoming Suez crisis. When Nasser demanded payment from the international community for using the Suez canal, the Israelis demanded that Britain go in and take it for them. Meanwhile, Churchill seemed unconcerned as the crisis unfolded. Instead he fell and broke a hip while drunk in the South of France and Sir Anthony described him as laying there like a drunken stag and joked with Churchill’s doctor Lord Moran that it should stop his political meddling . 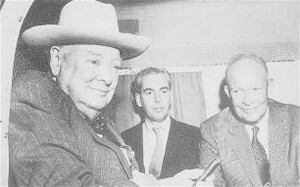 After the broken hip the RAF flew them both back to London and when Churchill died on 24 January, 1965 Montague Browne signed the death certificate. Sir Anthony would tell the story of how while at a gambling casino, Churchill was spotted by singer Frank Sinatra, who came past with his group and made a big thing of recognising Churchill and shaking his hand profusely, saying “I always wanted to do that” to his little entourage. Whereupon Churchill turned angrily to Sir Anthony and said “who the hell was that”? New Lies for old- Anatoli Golitsyn .